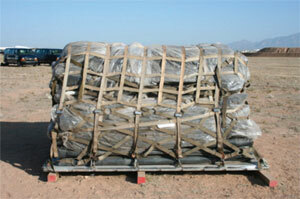 The Lift Bag Protective Case is designed for handling and storage of 15 & 26-Ton USAF Pneumatic Lift Bags. Each case accommodates a complete lift bag, which is comprised of 5 modules of 3 elements each. The case is made from tough, flexible material that is durable, resistant to weathering and blocks damaging UV exposure. Use of the case prevents many of the causes of damage that occur to lift bags when they are stored, transported or deployed. The case itself is compact and lightweight. 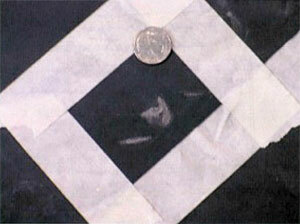 A common cause of damage to lift bags is abrasion due to improper handling, storage and shipment. The storage case features handle straps made of tough polyester. This enables proper handling by hand or fork-truck. Storage methods and conditions can vary. 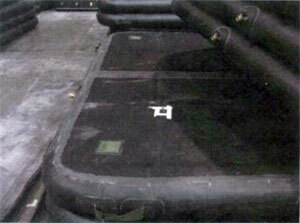 Lift bags are often exposed to damaging UV light. UV exposure accelerates degradation of the neoprene coated fabric. Rodents can nest in the bag material and cause damage by chewing. Lift bag modules may be damaged when packed in containers with rough surfaces, such as wooden shipping crates that are not properly lined. 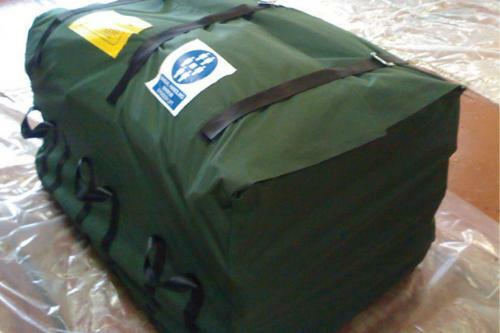 The durable PVC-coated polyester case material provides adequate protection when packed in any shipping container.